“The world of construction is changing fast. After two decades of reform efforts the construction industry in the UK is changing for the better. But both clients and suppliers face challenges in making full use of the unfolding potential. 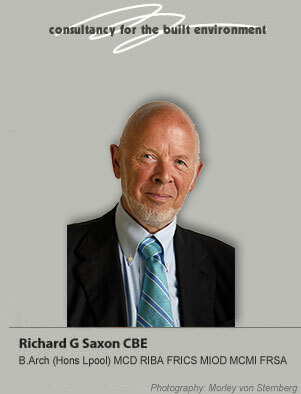 Richard Saxon acts as an adviser to clients, consultants, constructors and other businesses in the built environment sector. He helps them with project start-up and with business strategy. 28 years at the top of one of Britain's largest architect-engineer practices and 20 years involvement in the reform of the construction industry give Richard unrivalled experience to help you. He was UK BIM Ambassador for Growth 2012-3 and is a source of insight into the new technology and culture which is changing the scene. Look at Richard’s CV; read some of his writings; contact Richard to discuss your needs and put his experience and insight to work for you. Scoping study for research into how consultancies innovate. Commissioned by BERR, August 2007. Unpublished. Presentation to Property Asset Management conference, 2006. Report published by Constructing Excellence 2005. Lecture to the JCT in their series honouring its former secretary. 2003.
by David MacKay, in RIBA Journal 2009.
also published in RIBA Journal 2009. Foreword to planned book of a conference on the subject, 2008. Debate piece for Building Design, 2008.